Even though pirates do some things they shouldn't, they are always polite! 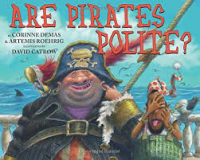 This book describes all the things pirates do and how no matter what they are doing, they are always polite. I would use this book with younger students to teach manners.